Chiropractic. Nutrition. Rehab… All of our resources are here for you. You’re embarking on your chiropractic journey… and Dr. JD Dudum and the rest of our caring team will be with you every step of the way. At Dudum Chiropractic, we see patients of all ages and backgrounds, so we provide treatment plans specific to your unique health challenges and goals. First, click the Online Forms button at right to download your new patient paperwork and fill it out at home, at your leisure. Be sure to bring the completed forms with you to your appointment — you’ll save some time on your first visit! Next, if you need help locating our Walnut Creek or Lafayette chiropractic office, take a look at our convenient Driving Directions below, so we can help you can plan your trip. 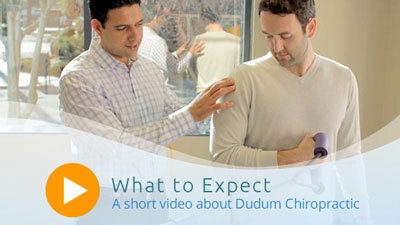 And finally, take a few moments to watch our short What to Expect Video at the top-right side of this page, so you can learn more about what to expect from your care at Dudum Chiropractic. Top Rated Local Chiropractor in Walnut Creek and Lafayette, CA. You will find us in Ste 104a. Click here for driving directions to our Walnut Creek office. We are located inside Oakwood Athletic Club. Click here for driving directions to our Lafayette office.